With many plates, illustrations, maps and tables. Less than a half-dozen complete sets of the Journal remain on hand. Price on application. The American Numismatic Society. Catalogue of the International Exhibition of Contemporary Medals. March, 1910. New and revised edition. New York. 1911. xxxvi, 412 pages, 512 illustrations. $10.00. Price to members, $5.00. The city of Alamos owes its name to the presence of numerous gigantic cotton-wood trees (Span, alamo) that grow in and around the town. It is the seat of the county of the same name. Its historical background is practically unknown, but its existence as a rancheria became known to the Spanish missionaries shortly after 1610, at which time Diego Martinez de Hurdaide signed a peace treaty with the Yaqui Indians. However, a mission was not founded there until 1630. * Its importance came with the discovery of rich ores in and around what is now known as Alamos, which at the time was called "Real de los Frailes," a name derived from two peaks that overlook the town and which are named "Los Frailes." Alamos was also known as "Real de Guadalupe," this third name being obtained from the hill that occupies the heart of the town; and it is still known as the"Cerro de Guadalupe." The discovery of gold, silver and lead ores occurred sometime between the years of 1683 and 1685. * The wordReal preceding the name of the town signifies mines. On page 79―"A request by the Governor of San Blas that mail be sent from the Capital (Mexico City) to California by way of Chihuahua and San Antonio del Presidio de Buenavista, to avoid the de- lay occurring when sent by Guadalajara and Los Alamos. 1794." On page 94― "Opinion of the Commandant General of the Interior Provinces concerning the withholding of certain funds from Los Alamos. 1780. " On page 125― "Correspondence of the Viceroy with the Officials of Alamos. 1780–81." On page 135― "Reports of the Sub-treasury (caja) of Los Alamos. 1776–79. " On page 148― "Memorandum (Memoria) of supplies for 1789 sent by the factor of the Californias, by way of Los Alamos. " The church edifice of the city of Alamos was completed about 1804 during the reign of Charles the Fourth, and the Coat of Arms of Spain can still be seen in the main façade of the building, and until 1825 the motto " Viva Fernando Septimo" could be read around the Coat of Arms. This edifice is the most magnificent of all the missions established in the northwest. It is constructed in its entirety of granite and cement, and having no rafters, the nave is made of beautiful arches in three rows supported by massive pillars. The church with its atrium occupies one whole city block. Until quite recently the sacred vessels, some of the images and some of the ornaments were of solid gold. The ecclesiastical robes were embroidered with fine gold and silver thread. There was a private chapel in the country house of the Almada family situated about two miles from Alamos proper, and it is said that it had beams supporting the roof made of pure silver and all of the sacred vessels of pure gold. Lieutenant R. W. H. Hardy, R.N. in his "Travels in the Interior of Mexico, " p. 170, speaks of having visited Alamos, March 31st, 1825, at which time he estimated it to have a population of about 6000 inhabitants. "The houses, " he says, "sufficiently indicate the opulence of its inhabitants and the luxury in which they live." Each house is adorned along its whole front with a portal of arches. This peculi- arity of Alamos has won for it the nickname of "City of the Archways," (Ciudad de los Fortales). The only amusements during Hardy's visit and during the century that followed were gaming, cockfighting, bullfighting and a sort of hand ball, played over a court having two walls at right angles with each other, about 75 feet high and 150 feet long, to which the natives give the name of "El rebote. "Taking a cab and riding around the Alameda, an avenue and park lined with poplar trees, was a popular pastime of which the young were quite fond and which was indulged in every afternoon, but particularly on Sundays and holidays. Gambling among the ladies was the rule rather than the exception. In 1825 the ore mined in the Real de Los Alamos ranged from $80,000.00 to $100,000.00 monthly. From the Batopilas mines $60,000.00 was taken out in one week, and Hardy himself saw specimens of ore weighing 35 pounds, yielding after refining 32 pounds of pure silver. One of the mines of Batopilas, owned by a Mr. Robinson, gave a net profit of $5,000,000.00 in nineteen years. When Mr. Robinson sold his mine in 1869, he caused medals to be struck, commemorating the completion of the work. (See cut on page 6.) The decadence of Alamos began with the low value of silver which practically forced all the mines to close in 1909. The main line of the Southern Pacific Railroad of Mexico is 72 kilometers (39 miles) away, serving Alamos with a branch line which was completed in 1907. The Vice-President of Mexico, Ramon Corral, a native of Alamos, virtually compelled the railroad company to put in this branch. 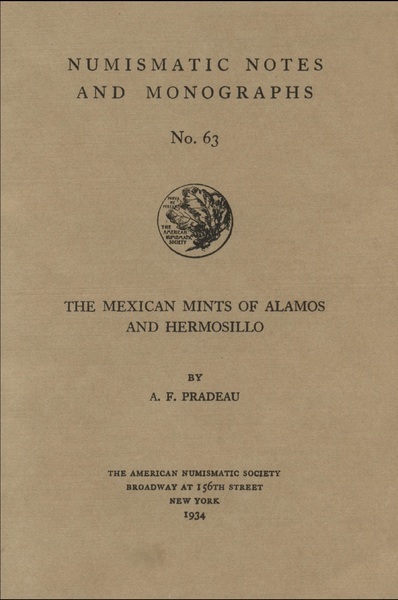 The able-bodied men who had seen better days in Alamos began to search for other fields of endeavor and the exodus of the population has never ceased, and at the time this monograph is being written (January, 1933) there are hardly 1000 inhabitants in Alamos and its immediate vicinity. There is only one train a week into Alamos. El Estado do Sonora. Pedro N. Ulloa. Chapter X, p. 134. Favores Celestiales. Eusebio Francisco Kino, p. 205. Bancroft, History of the North Mexican States, vol. XV, p. 574. El Estado de Sonora , p. 135. Reseña Historica de Batopilas . J. S. Pareja. 1883. The chief reason for the establishment of a mint in Alamos was the bonanza existent in the mining districts in and around the city. Owing to the isolation of this mining center which had no railroad until 1907, communication with other cities was possible only by stage-coach, saddle and pack animals. This means of conveyance was anything but safe, and while the convoys, carrying out the silver bars or bringing in the coined gold and silver, were properly escorted by armed guards, these were often outnumbered and massacred by the marauding Yaqui Indians or bandits constantly roving in search of plunder along the routes that led to Alamos. Whether this mint was established by federal or state decree I have not been able to ascertain, but it is reasonable to assume that due to the French intervention existing from 1862 to 1867, and the inaccessibility of the region, the local authorities had much to do with its foundation. During this period, when the central government was constantly being changed from one locality to another, the states exercised the rights of independent governments, subject to approval of the federal government at such times as it was possible to get in touch with it. According to official records the first coinage of this mint is given as 1868, but J. W. Bastow, writing in the American Journal of Numismatics, Volume XXXII, No. 1, of July 1897, page 17, gives the date of the first minting operations as 1864. I am wholly in accord with this, as I have in my collection an eight escudos piece dated 1864. 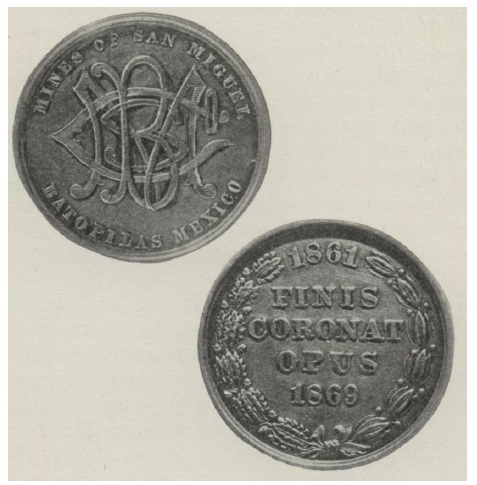 Mr. Santiago Ramirez in his" Noticia Historic a de la Riqueza Min era de Mexico" edited by the Government of Mexico in 1884, page 47, gives the beginning of coinage for the Alamos mint as of 1868. And one after another a number of writings on Mexican numismatics might be quoted in which every one has used the official archives, which, as I have stated, are incorrect. The error was caused by the unsettled condition of the country due to the French intervention and the subsequent monarchy with Maximilian of Austria as Emperor, which lasted until 1867. It is more than probable that the records of the mint, which were supposed to be sent to the treasury department (Secretaria de Hacienda), were either lost in transit or destroyed. "Not a single document is to be found in the national archives, that will throw light on the revenue-yielding industries of the country during the five years of French intervention in Mexico (1862–1867) excepting those of the mint at Mexico City, the records of which were kept quite accurately." "The Minister of Finance (Secretario de Hacienda) in a circular letter addressed to all the mints of Mexico, asking for information about the amounts coined in each, during the years of 1857 to 1867, failed to bring in a report for the mint at Alamos, which is not even mentioned." The very fact that coins of all denominations bearing the dates of 1864, 1865, 1866 and 1867 are to be found is conclusive proof that the Alamos mint was in operation from 1864 until 1895 at which time it was closed. The information concerning the opening date is corrobo-rated by the statement of Mr. Bastow who obtained the information directly from the officers of the mint, while still in operation or shortly after its closing. This mint was turned into a federal assay office. The personnel of the mint was retained. From Don Manuel Larraguibel, last mint master, and from Mr. Jorge LeBrun, son of the director of the mint during the years 1878 to 1883, and from Don Lauro B. Quiros, all old residents of Alamos, I learned that the Alamos mint was established with modern machinery propelled by steam power, but that hand presses were available and used for coining silver pieces of small denomination such as half and one real pieces, which from 1874 became five and ten cent pieces. During most of its life, this mint was leased to private individuals or companies, and although the official records only show the leasing of this mint for the years of 1876 to 1880 inclusive, I have obtained from the above mentioned sources, statements that several companies leased this mint. The most prominent and the one which had it under contract the longest, was the English firm of Symon and Camacho. Several attempts to obtain a copy of this or any other contract have proven futile. Hermosillo cuartillas are found in Guttag Catalogue for the years 1832, 1833, 1834, 1835 and 1836; in the Catalogue of Coins of the United States Mint, 1912 edition, for the year 1837; in my own collection for the years 1832, 1833, 1834 and 1835. The mint mark was a single capital "A" or "As." or with the "s" at a slightly higher level than the "A" thus " " with a dash under it. At the time of this writing, February 12th, 1933, Mr. Manuel Larraguibel, the last mint- master of Alamos, a grand old man 83 years of age, whom I had the privilege of knowing in Alamos some thirty years ago, and now a resident of Navojoa, Sonora, Mexico, writes to me and states that the mint in Alamos was established by Mr. Robert R. Symon, a British subject, and that in later years Mr. Robert R. Symon and Mr. Sebastian Camacho, formed a company under the name of Symon y Camacho and leased the mints of Alamos, Hermosillo, Culiacan and Durango. On March 1st, 1933, Don Manuel Larraguibel writes: "No coin could carry any other initials than those of the assayer" and that "Frequently when the dies for the new year were not available, those for the previous year were used." Mr. Robert R. Symon, a British subject, received authority to establish the Hermosillo mint from the local government of Sonora. Later the same privilege was extended to the same individual for the establishment of the Alamos mint. Mr. Symon was ably assisted by Mr. Quintin Douglas, an American engineer, in the establishment and manufacture of the mint machinery. Mr. Manuel Larraguibel in letter of March 30th, 1933, says:"In Alamos we used at the mint a set of large scales, so well constructed that when weighing 30 or 40 kilos (66 to 88 pounds) it would register half a gram (8 grains). These balances were made by Mr. Douglas." Nothing is mentioned about the revenue that the lessors were to pay during the second ten years of operation, but two facts are definitely established; first that the mint at Alamos was founded in 1861, or at least contracted for, and operations must have begun almost immediately, as Mr. Manuel Larraguibel, the last mint master, in his letter of February 7th, 1933, gives the year of 1862 as the date in which the first minting operations took place in Alamos; and secondly that the state and not the federal government was responsible for the establishment of these mints. From its inception in 1864,*until June 30th, 1873, this type of coinage consisted in its entirety of "onzas" of eight escudos or as known in Alamos"onzas de a diez y seis" (ounces of sixteen), each escudo being worth two pesos. These onzas were of the type authorized by Act of Congress dated August 1st, 1823, having on the obverse the national arms of Mexico, consisting of the eagle on cactus, facing front, and devouring a serpent; beneath, around the margin and occupying the lower half, two branches united in the center by a bow knot. The branch on the left is oak and the one on the right is olive. On the upper half of the margin are the words REPUBLICA MEXICANA. The reverse presents in the center of the field a forearm, book and staff with liberty cap. Around the margin, upper half, the legend: LIBERTAD EN LA LEY (Liberty within the law). On the lower half around the margin: 8 E. (indicative of the value, which is, in this case, eight escudos); A. (the mint mark which in some pieces is represented by a capital "A" followed by a lower case's", or underscored by a dash" "); the date; the minter's initials, and the fineness of the gold expressed in karats (21 quilates). Gold coins of four, two, one and one-half escudos were not coined in Alamos. As stated in another part of this monograph, the official records do nothave the amounts of gold minted previous to the fiscal year of 1867–1868 in which 521 onzas were coined. During the second half of the year of 1873, or the first part of the fiscal year of 1873–74, the type commonly known as the balances design was introduced. * With it the metric system was also initiated in all coinage excepting the eight reales and the two reales pieces, which continued to be legal tender in the Republic, the eight reales until 1895 and the two real pieces until 1890. With the balances-design, the obverse continued the same as in the escudo type of coinage, but the reverse presents in the center of the field a set of scales (a reference to the Judicial Branch of the Government) supported by a scroll in which the word LEY is written, indicative of the constitution and of the Legislative Branch; and a sword slanting from right to left, back of the scroll, signifying the Executive Branch and over all the liberty cap with radiating rays. In the lower portion of the cap is the legend LIBERTAD. There is no motto in the upper part of the field, but in the lower half one reads: the mint mark ; the minter's initials or initial followed by a period (. ), then in capitals the value of the coin such as VEINTE PESOS (twenty dollars); DIEZ PESOS (ten dollars); or CINCO PESOS (five dollars); another period (.) and then the fineness expressed in thousandths, which in this type of coinage is .875. It is worthy of note, that at this time, Mexico was on a gold basis and the gold coins of this epoch represent a value equal to that of similar sized coins of the United States of America. It is well to call to the attention of the reader that twenty pesos gold pieces were minted only during the fiscal years of 1877 and 1878, which of course, include the second semester of 1876, and the first semester of 1879; that no ten pesos gold pieces were coined during these same fiscal years, while five pesos gold pieces were minted during the fiscal years of 1873–74, 1874–75, and 1877–78 only. Two and a half pesos gold pieces and the one peso in gold common to other mints were never coined inAlamos. 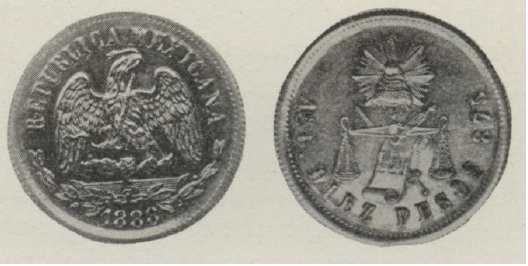 From its foundation in 1864* to the year of 1895 when the mint in Alamos was closed, the eight reales pieces minted in Alamos were of the usual or old type authorized by Act of Congress in 1823, which had the obverse as described under the heading ofgold coinage, and for its reverse in the center of the field a liberty cap with rays radiating from it, and the wordlibertad on the brim of the cap. Around the margin, lower half, one reads the value ex-pressed in reales (8 R.); the mint mark (either A. or ; the date: the mint-master's initials: and the fineness expressed as 10 20 (10 dineros, 20 granos). As mentioned before the balances-design in the dollar size was never used in Alamos, either because the dies for this type of coinage were not sent or did not arrive on time, for they were minted from 1870 to 1873 inclusive, in all mints of Mexico exceptAlamos. Mr. Manuel Larraguibel, the last mintmaster, in his numerous letters insists that pesos of the balances-design were struck in the Alamos mint; however, after thorough search, neither he nor the compiler has been able to find a single specimen. In 1873 the old or usual type of coinage was resumed throughout Mexico. 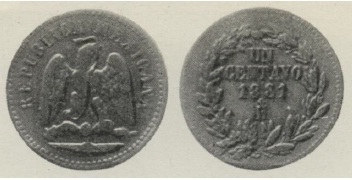 I am not able to discuss the reason for stopping the coinage of the balances-design, dollar size, just three years after its appearance, but as Mr.Thomas W. Voetter, formerly of the American Consular Service, suggests, it might have been the same reason that brought about the suspension of coinage in the United States of America of the trade dollar. It is quite possible that the Chinese refused to accept it. The itemized figures of the coinage Alamos are not available previous to the fiscal year of 1874–75 and for the following twenty years it amounted to $16,312,379.00. It is assumed the mint was opened during 1864 as coins bearing an earlier date have not been found. Fiscal year has reference to the twelve month period beginning July 1st of one year and ending June 30th of the following one. This information pertains toAlamos only, as the balances-design was brought into existence in all the other mints in 1870, but no doubt, due to the remoteness ofAlamos, it was impossible to establish it there before 1874. This tabulation was obtained from the official publications of the National Treasury ofMexico, but I am quite positive it is not accurate. I have a twenty pesos piece dated 1888, in which year none were supposed to have been coined. These were coined from 1864 until June 30th, 1874, but no itemized record of the yearly coinage is available for each denomination for this period, and all one is able to obtain is the total amount of silver coined, and this only from 1868 on. The type used in this denomination was similar to the eight reales pieces, but proportionately smaller. It has not been my privilege to see a single specimen of this denomination, nor have I located one of them in any of the sales catalogues consulted. Beginning July 1st, 1874, all the coins minted inAlamos excepting the eight reales pieces, were struck with new dies made to conform to the existent regulations adopting the metric system. Thus the four reales piece became the fifty centavos piece. The new dies were of the balances-design described in the section pertaining to gold coins, with the following variation on the reverse: the legend around the margin reads 50 centavos, immediately after the mint mark; then the minter's initial; and last, one finds the fineness expressed in thousandths, 902.7. Coining of the fifty centavos pieces was discontinued June 30th, 1886. Specimens of this denomination are quite common. In my own collection I have five of them corresponding to the years 1875, 1876, 1877, 1878 and 1880. These were also minted from 1864 to June 30th, 1874, using dies of the old design. I have a single specimen of this type and denomination dated 1872, minter's initials A. M. They ceased to be legal tender in 1890. No yearly record of amount coined is available. This piece supplanted the two reales variety. The dies used were of the balances-design and were similar to the fifty centavos piece except for the size, and the legend which reads 25 centavos. No record has been found of any specimen sold at auction or catalogued in any collection. Mr. Thomas W. Voetter has a twenty-five centavos piece of the balances design, dated 1885, and I have four dated 1875, 1883, 1886 and 1890. See table for amounts coined. 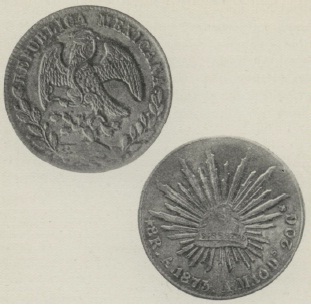 I have seen two specimens in Mexican collections of the one real pieces minted in Alamos, carrying the usual old design of the upright eagle on cactus on one side and the liberty cap with radiating rays on the other. A real was equivalent to twelve and a half cents. This type was discontinued June 30th, 1874, at which time this denomination was superseded by the ten centavos piece. No record of the amount coined is available. The obverse presents in the center of the field the eagle in the upright position, with the snake held with the claws of the right leg and the beak. The eagle stands on a cactus growing in a small mound. The legend reads republica mexicana. In the lower half, under the mound, is the date of mintage. The reverse shows in the upper margin the mint mark ( ), the minter's initial, and the fineness expressed in thousandths, 902.7. In the center of the field a large 10, and under it the word centavos The lower margin presents the two branches, of oak on the left and of olive on the right, united in the center by a bow knot. During the years 1876, 1877 and 1878 there was no coinage of ten centavos pieces and the last year of mintage was the fiscal year of 1893–94. The total amount coined of this denomination was $51,317.70. See table for the amounts minted each year. The medio-real pieces were coined from 1864 to June 30th, 1874, but I have never seen one of them. They were of the usual old design, similar to the one real pieces but proportionately smaller. Upon the adoption of the metric system, these pieces were superseded by the cinco-centavos pieces. No record of the in-dividual yearly coinage is available. I consider the four, two, one and half real pieces of Alamosmint extremely rare. This is not the case with the fifty, twenty-five, ten and five centavos pieces, of this same mint, which are more or less common. It is similar in every respect to the ten centavos variety, except for being smaller in size and carrying a large 5 in the center of the reverse side. Coinage of this denomination began in 1874 and continued until 1895, at which time the mint at Alamoswas closed. During the fiscal years of 1876, 1877, 1878, 1882, 1883, 1884 and 1885, coins of this denomination were not minted in Alamos. The total amount coined was $13,377.60. See table of silver coinage for the yearly output. There were no other types coined in Alamos. The nickel coins that came into existence in other parts of the Republic, were never minted in Alamos. 8 Escudos 37 mm. 27 gm. 20 Pesos 34 mm. 34 gm. 10 Pesos 27 mm. 17 gm. 5 Pesos 21 mm. 8½gm. 8 Reales 39 mm. 26 ½ gm. 2 Reales 25 mm. 6 ½ gm. 50 Centavos 31 mm. 13 ½ gm. 25 Centavos 25 mm. 6¾ gm. 10 Centavos 17 mm. 2 ½gm. 5 Centavos 14 mm. 1⅕ gm. Besides the director or mint master, there was also a federal auditor whose official title was that of "interventor," an assayer, and an engraver. For some unknown reason, some of the coins minted had the mint-master's initial or initials, and others minted the same year, but of different denomination carried the initials of the interventor. The alternations were most likely a personal equation, prearranged between themselves, a courtesy perhaps, that one was willing to extend to the other, but light on this point has not come to me through any source. In the gold and silver coinage of the balances-design, only one initial appears. Mr. Larraguibel insists that the only initials authorized to appear on any coinage were those of the assayer. The Alamos mint was closed by order of the federal government on the last day of June of 1895. The machinery and dies were sent to the mint at Culiacan, State of Sinaloa. The building occupied by the mint continued as the federal assay office and the officers of the mint were retained until 1911, and discontinued after that. The building was located on the corner of "Calle de las Flores" and "Callejon de la Casa de Moneda." This street is only two blocks long. After the government had given up the federal assay office, the building was then purchased by D. Reynaldo Ramos, who by using more modern methods of assaying was able to obtain from the discarded tailings left in and around the old mint, a sufficient profit to repay him for his labors. There was also a period in which the whole lot occupied by the mint was excavated to a considerable depth in the belief that there might be a buried treasure, frequent- ly found in the old houses of the city of Alamos. In the latter part of the month of December 1927, it rained in Alamos twenty-four inches in seventy-two hours, and this as well as the excavations that had preceded, caused the walls of the old edifice to crumble. So, today, April 25th, 1933, nothing remains. The useable wood and iron work were transported by Mr. Ramos to Navojoa and used in the construction of another building. The first copper coins issued in Mexico, which at the time was known as New Spain, were those ordered struck by the Viceroy Antonio de Mendoza in 1537. The Indians had refused to accept a base metal without intrinsic value. Upon being compelled by their conquerors to receive the coins the Indians threw them into the Texcoco Lake. This procedure compelled the Colonial government to cease coining copper. The amount coined at that time was $200,000.00, and the denominations were one, two and four maravedies. During the War of Independence, 1810 to 1821, the insurgent leaders resorted to the coinage of copper when their resources did not permit them to coin silver. Thus we have the Morelos coinage, so ably described by Dr. Nicolas Leon and by Mr. Lyman Low. * There is also the copper coinage of Osorno described by the author.† Many other lesser chieftains coined copper coins during this hectic period of Mexican history, but no record is available of the quantity placed in circulation. In the Adolph Hess sale of the Ulex collection, held on May 11th, 1908, items 1860–1861, page 75, were three one cent pieces of theAlamos mint dated 1874 and 1876. American Journal of Numismatics, Vol. 21, p. 17ff. ; Vol. 29, p. 1 off. Apuntes Biograficos Historicos. Mexico City 1932. Zamacois. Historia de Mexico , Vol. IX, p. 592. Gazeta de Mexico , December 22, 1814. Zamacois. Historia de Mexico , Vol. XII, pp. 248–249. A new coin of an eighth of a "real" shall be minted weighing one half ounce; the figure of liberty to be on the obverse and on the reverse a wreath with the value of the coin in the center. Around the margin republica mexicana. The secular and regular clergy, brotherhoods, chaplains, pious workers, executors, etc., must deliver immediately to the treasury department, revenue tax offices, state or municipal tax collectors, all of the copper money in their possession. The amounts turned in will be returned in new money within six months of the time received, unless arrangements have been made to the contrary. Private interests, be they individuals or corporations, will deposit for exchange in the offices named in Article Two all of their copper coins. As soon as the mint has a sufficient amount of the new copper money it will proceed to reimburse the amounts deposited for exchange in compliance with the foregoing articles, and it will also remit to the national treasury the part belonging to the government. The copper money, which by virtue of this decree, is to be withdrawn from circulation, will cease to be legal tender thirty days after the publication of this decree in the Department of Mexico and sixty days after publication in the other departments (states). After this period, holders of the old copper coins cannot claim indemnity for the loss that they might suffer for not having availed themselves of the opportunity offered in Articles Three, Four and Five of this decree, and it is hoped that the interested parties, for the public good as well as their own, will assist the government in carrying out these measures. The penalties prescribed by the existent laws to punish counterfeiters will continue in effect, but shall be more rigidly enforced. While this law was timely and desirable, it created untold hardships on the poor, and the interests of honest merchants suffered greatly, as all were deprived of a certain quantity of money at a time when the country was in narrow straights. The government's credit was not very good, the people distrusted the measure, and the result was that the majority preferred to take a chance with the old money rather than with the promises of a bankrupt and unstable government. It would have been much better to have coined previous to the publication of the above decree a sufficient amount of the new copper coins to take care of the exchanges upon presentation without waiting six months and causing confusion among all parties concerned. This law did away with the coinage issued by Mr. Santoyo in Sonora, which in my estimation amounted to 540,000 pieces of "cuartillas" or $16,875.00 pesos. As Mr. Santoyo did not have machinery, he had to stamp his coins by means of hand punches. His coining activities covered a period of six years, from 1832 to 1837 elusive. Figuring a year at 300 days, we find he had 1800 working days and during each day with the primitive methods used to make the planchets, cut the disks and stamp them, I judge Mr. Santoyo was able to finish approximately three hundred. This will give us an estimate of 540,000 pieces coined, at three and one eighth cents a piece, giving the total value coined as $16,875.00. In the State of Sonora, as well as in other states of the union, copper had been coined in large quantities, more with the idea of obtaining personal gain than to provide for the need of commercial transactions. Mr. Leonardo Santoyo coined "cuartillas" or "cuartos de real" in Alamosand Hermosillo from 1828 to 1837 and no record is to be found of the amount coined. The mint at Hermosillo was established in 1851 and no record of its coinage in any metal is to be found anywhere until 1861. During the year of 1861, $35,228.86 was struck in copper coins in the mint atHermosillo, and the following year $38,220.98 was coined in the same mint of the same metal, a total of $73,449.84 in "cuartillas." The copper coins in circulation in the state ofSonora(of its own mintage as well as of neighboring states) had well nigh reached the limit of the district's capacity for absorption. The amounts known to have been coined in these two years in a state having 130,000 population (mostly Indians) made the average per head excessive and burdensome. Merchants were compelled to retail their goods for copper coins which they could not dispose of except at a heavy discount, as the law limited the amount acceptable as legal tender. By 1867 this state of affairs had become a serious problem, and to solve it two steps were taken by the governor and military commander, Don Ignacio Pesqueira, one of the most colorful characters of the state's history. The first step was to stop coinage of copper until such a time as commercial transactions justified its resumption. This was a healthy measure that helped all classes. The poor with a meager income of a few cents a day, seldom earned more than seven dollars a month and had practically nothing else to use as medium of exchange. The rich were safeguarded from becoming the sole and unwilling hoarders of this undesirable and unwanted currency. The price of commodities was stabilized and an era of freedom from copper money worries ensued and this lasted until the Republic was able to establish the sound monetary laws of Finance Minister Limantour in 1905. In only two instances did it become necessary to resort to copper coinage between 1862 and 1905. The mint at Hermosillo coined copper during the year of 1880 amounting to $1,024.00, and during the year of 1881, $4,586.00—both amounts in one centavo pieces. In the Alamos mint copper was coined from 1874 to 1876, $495.00 in one centavo pieces, and again in 1880–81, $1,250.00 in the same denomination, for a total amount of $1,745.00. Thus the total amount coined in both places reached the moderate figure of $7,355.00. This loan will be payable in three installments; the first being due eight days after the publication of this decree in the district affected, the second is to be paid eight days after the first installment has become due, and the third, eight days after the second installment becomes due. In case of delay in the payment of this loan, the committee shall notify the collector of internal revenue, who in turn shall apply the penalty prescribed by law. In the time and form judged the most appropriate, the government will transfer these funds to adequate points to begin rendering inalienable and permanently out of circulation the copper coinage. To reintegrate this loan one fourth of the revenue of theGuaymasCustom House is hereby pledged and assigned. The exchange of copper coins for gold or silver shall cease within forty days after the publication of this decree, and after that time copper coinage will cease to be legal tender. The respective committees in charge of collecting the assigned amounts in the counties of Hermosilloand Ures are hereby authorized to exchange copper coinage paying two-thirds of its face value in silver or gold. The only compensation authorized for the committees shall be one and a half per cent of the total sum of gold and silver collected by the respective committee. The committees shall render accurate accounts of the amounts of gold and silver collected and also of the copper coins exchanged to the collector of customs of the state, said accounts to be certified by the sheriff and military commander of the county. The government shall order the melting of the copper coins so exchanged into bars for its disposal as bullion. The persons and private or municipal corporations that by virtue of a previous agreement are bound to pay a debt in copper coin, at a time when the circulation of this type of coin has been prohibited and declared illegal, shall make such payment in gold or silver at the rate specified by article eight of this decree. This decree shall be proclaimed, printed and circulated for its due observance. Issued atHermosillo, the nineteenth of June of the year 1867. Thus from 1862 to 1880, excepting $495.00 coined inAlamos during the years of 1874, 75 and 76, the State of Sonora was free of copper coinage. The "tlacos" or tokens were brought into existence when commercial transactions made it necessary, but in Sonora, where all business firms resorting to this form of script were usually quite trustworthy and responsible, this phase did not cause the hardships and tribulations more frequently experienced in the larger cities of states not so isolated. For the years 1864, 1865 and 1867 no known record coined are available. The city of Hermosillo is the county seat of the district or county of the same name, and also capital of the State of Sonora. It is located on the left bank of the Sonora River at 29° 17' 46" north latitude and 11° 8' 58" west longitude of the meridian of Mexico. * The city itself has a population of approximately 15,000 inhabitants. The first historical reference to the site now occupied by the city of Hermosillo, at the time a small colony of farmers (rancheria) known by various names (San Diego del Pitquin; Santisima Trinidad de Pitiquin; and Pitquin) is given in book three, page 32, of"Las Misiones de Sonora y Arizona" which comprises the manuscripts of Fr. Eusebio Francisco Kino (Kuhn) the revered missionary who made possible the discovery of the Californias. This citation is dated October 1694, but the city's existence, while not mentioned previously, must have been known to Kino as early as 1687, for if one follows his explorations, one can easily discern this to have been the case. ToJuan Matheo Mange, the Captain who accompanied Fr.Kino, we are indebted for a better description to the site. In his"Diario de Las Explora- ciones en Sonora " page 334, he says:"There are other rivers; the sources of one being in the plains of Terrenate and Cananea at 32°, and as it flows south it supplies the townships of Bacuachi and Cinapa; there is another that arises from the valley of Bacanuche, it follows a southeastern course, unites with the first river mentioned at Arizpe and fertilizes the whole Sonora Valley, irrigating the townships of Senoquipe, Banamichi, Guepaca, Aconiche, Bavia, Cora, Ures, to Pitquin, where it unites with another river that has its source higher than 30° which follows a southwardly course and irrigates the townships of Dolores, the first of the missions of the Pimeria Alta, Cucurpe, Tuape, Opodepe, Nucameri, Populo and Angeles; then it unites with that one of the Pitquin, as has been said, where there exists the great stone mountain known as 'La Campana' (the bell)." The name, according toVelasco, was given to this hill, around whichHermosillo is built, because upon striking the rock with another rock it emits a metallic sound similar to that given by a bell. Until 1741Hermosillo was known as Pitic. At this time apresidio (fort) was ordered by the Viceroy Don Pedro de Castro y Figueroa, Duque de la Conquista to be constructed at Pitic, and no doubt Don Agustin Vildosola, then Governor ad-interim, substituted the name of San Pedro de la Conquista for Pitic in adulation of the Viceroy, hoping in doing so to win favor. In 1744 the governor received from the viceroy an order to discontinue the presidios of Pitic and of Terrenate. This order was based on royal instructions to cut down expenses. On June 24th, 1744, Governor Vildosola who had been residing in Pitic protested against this order and declared his intention to disobey it until the viceroy could consider his arguments which must have been strong and effective as the presidios were not abolished. In 1748 the viceroy sent José Rafael Rodriguez Gallardo as Visitador General (Inspector General) and he moved the presidio of Pitic to San Miguel de Horcasitas where it remained a few years. Later it was brought back to Pitic, but as the group of soldiers in the garrison had received the name of "Compañia de Horcasitas" (Horcasitas Company) upon moving they carried the name with them, and Pitic, then only a garrison, became known as Horcasitas. This last name, however, never became official. On the fifth of September 1828, the Congress of the State of Occidente, in a proclamation (No. 77) changed the name of Pitic to Hermosillo, in memory of General Don José Maria Gonzalez Hermosillo, who according to Morales was born in Pitic, and who received his commission and two promotions directly from Don Miguel Hidalgo y Costilla, father of the independence of Mexico. 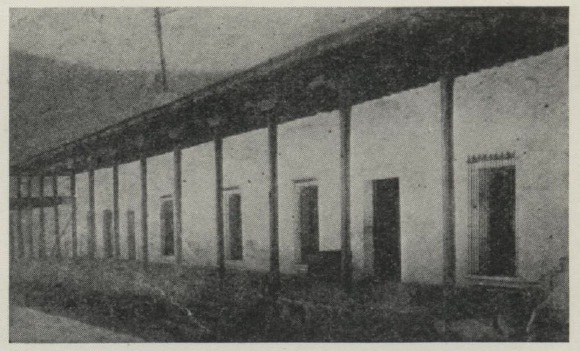 In 1830, when the State of Occidente was dissolved and Sonora became an autonomous unit, Hermosillo was selected as capital, but during 1833 the capital was moved to Arizpe, and from Arizpe it was changed to Ures several times between 1841 and 1847. However, by proclamation of the legislature of August 19th, 1843, Hermosillowas declared the capital of the state. This decree was not enforced and the capital remained in Ures until 1879, when it was definitely and permanently moved to Hermosillo, where it has since remained. A very important event, not only for Hermosillo, but for the state as a whole, and for this narrative in particular, is the fact that the contractor and lessee as well as founder of the mints of Alamos and Hermosillo, Mr. Robert R. Symon, and his co-worker, Mr. Santiago Camacho, were the builders of the railroad that extends from Guaymas to Nogales, passing through Ortiz, Hermosillo and Magdalena. As was seen in the narrative of the Alamos mint, the firm of Symon and Camacho had been prominent in leasing and operating the mints of Sonora and Sinaloa, buying the concession for a mere pittance and earning a huge fortune out of the transaction. Building a railroad was not an impossible undertaking for men whose wealth had been acquired so easily. Although several individuals or companies had previously obtained the same concession, for one reason oer they had done nothing, and their rights had been forfeited. Messrs. Symon and Camacho started work on the proposed railroad line months before they were granted the concession and if they benefited by the leasing of the mints and by the construction of the railroad, so did the state. Today any unbiased individual cannot help admiring the enterprising spirit of these two men, who so greatly contributed to the political and economical advancement of the State of Sonora. Geografia de Sonora , p. 30.José María Perez Hernandez. In the annual report of the Secretary of the Treasury to Congress dated February of 1844, page 28, he says:"The federal government in order to prevent the constant smuggling of gold and silver that was taking place from the States of Sonora and Sinaloa through the seaports of Guaymas and Mazatlan, issued an order whereby the export duty on metals was considerably reduced, but the miners complained of the enormous distance from their mines to the existent mints, the risk involved in transportation and the subsequent delay at the mint, and as no gold or silver was allowed to be exported unless coined, smuggling continued. In order to stop this leakage, the federal government by Presidential Proclamation dated February 16th, 1842, ordered the resumption of the mint at Hermosillo (closed since 1835), and encouraged the state government to promote the establishment of this mint, authorizing the state to levy a forced loan, or to enter into an agreement with private interests or individuals, to bring about the desired results, notifying the federal government about the conclusions reached, for its official endorsement." (Free translation.) This order has reference to the private coining operations of Mr. Santoyo during the years1832 to 1837, which were carried on in a most primitive manner by means of hand punches. The central government considered this establishment a true mint, but realizing that it might not be an efficient one, authorized the state to negotiate a loan or to enter into an agreement with private parties, whereby an adequately equipped mint could be operated in Hermosillo. However, nothing was done about the re-establishing of the mint in that city until 1851, and the State of Sonora did not coin money in any metal from the year 1837 until the mint was re-opened in Hermosillo in 1851. As was said when dealing with the history of the mint of Alamos, the mint in Hermosillowas established in 1851 by Mr. Robert R. Symon and his co-workers, Mr. Sebastian Camacho and Mr. Quintin Douglas. The mint was leased for a period of twenty years beginning in 1851 and ending 1871. All my efforts to obtain a copy of this lease have been futile, but it was my good fortune to discover a piece of information given by Mr. Antonio Peñafiel who found that the mint at Hermosillobegan operations in 1852. The existence of such operations was unknown to the treasury department at Mexico City until 1861, as no reports were sent to the federal government previous to that time. This is not strange; at that particular period of Mexican history the states functioned as sovereign and independent units and had the right to legislate and issue their own coinage. It is also not surprising that the records of mintage of both Alamos and Hermosillo are not found in the archives of the State of Sonora, because from 1830 to 1885 the state was in a constant turmoil, having to combat the Apache Indians on the north, the Yaqui Indians on the south, and having besides to put up with constant strife of warring political parties, certain of which burned priceless records in order to escape prosecution. At any rate, the mint ofHermosillo was leased to private individuals until 1871 or 1872, and neither the state nor the federal government derived any revenue for the first ten years, nor, so far as is known, for the second ten years. That the State of Sonora entered into a contract with Mr.Robert R. Symon, leasing the mints of Hermosillo andAlamos for a period of twenty years beginning January 3, 1851. The state guaranteed the lessee that no federal, state, or municipal taxes were to be assessed against the lessee for the first ten years, and only one per cent for the second ten years. The state was to allow the importation free of duty of the machinery, implements, reagents, etc. needed in the erection and to be used in the operation of the proposed mints. The state was to permit the unlimited coinage of gold, silver and copper. At the termination of the contract the lessee promised to turn over to the state the mint machinery, implements, reagents, etc. which from then on would become state property. The contract of this same date, made by the minister of Finance with the firm Robert R. Symon & Company, leasing to the latter the mints of Hermosillo, Alamos and Culiacan, is hereby approved. Therefore this order shall be printed, published and circulated to be complied with in due manner. Given at the National Governmental Palace at the City of Mexico, this twenty-ninth day of August of the year 1876. "The opposition newspaper 'El Occidental' published in Mazatlan, in its number of the 7th instant charges that the federal government has made a grave mistake in leasing the mints of Hermosillo, Alamos, and Culiacan, and that this act will create a hardship to the miners and mining industry. "We believe that there is no basis to this charge, and we are positive that in leasing the said establishments, the federal government has taken into consideration and consulted the economic side of the problem as well as the public welfare. "Since the last lease expired the government took over the aforementioned mints and from that time an ever increasing operating expense and loss has been reported in connection with these mints. So the government in leasing them for twenty thousand dollars for a three and a half year period, will not only be saving itself additional expenses and losses, but in reality will be that much money ahead. "On the other hand, the taxes on the mining industry will continue the same as before; so, where is this terrific blow, that according to the newspaper 'El Occidental' the Mexican miner will receive? It is hardly credible that the contract entered into for a period of three and a half years and expiring in 1879 or 1880 would have been given back to the lessee in 1893 unless extended in the meantime. However, after two and a half years of effort one must accept this answer as final. Perhaps in a not distant future these documents will come to light, as it is my belief that these documents exist. "Under the Spanish laws all silver paid a duty; and as most of it was coined, that duty was levied on coinage, and the exportation of bullion was prohibited; but of course a great deal was smuggled, both during the Spanish rule and still more when Mexico was opened to foreign trade after our independence. When I occupied for the first time the Treasury Department of Mexico in 1868, it seemed to me an outrage against the mining industry of the country to require the miners, especially those who were far removed from the mints, to take their bullion to the mints, and from there to the ports to be exported to London, where it was often again turned into bullion; and as the contracts made with the lessees of the mints did not allow the free exportation of bullion, I proposed and succeeded in having enacted a law for the purpose of allowing bullion to be exported, provided that it paid the coinage duty at the respective customs houses for the benefit of the mint's lessees; and this condition of things, extraordinary as it may seem, was a great relief to the silver producers, and continued until the Mexican government could recover all the mints and be free to legislate on the subject. " "There were thirteen mints in the country to coin the silver extracted from our mines, which, in the precarious condition of the Mexican treasury, were sometimes rented to private parties who advanced a sum that seemed large enough at that time, although it was a trifle in comparison to their profits, as they collected a duty of nearly four and a half per cent upon the amount of bullion coined, and they credited to the government only one and a half per cent of the same. " and this was for a period of three years only. No doubt the loss was much greater because the contract was for three and a half years. From 1842 to 1893 practically all the mints of Mexico were leased, and in every instance the terms of the various contracts were extremely advantageous to the lessees and detrimental to the government. Looking back, all one can see is a total disregard of the country's interests. The statement made by the official Bulletin of the State of Sonora in defending the action of the government, in leasing the mints of Alamos, Hermosillo and Culiacan — because from 1871 to 1876 there had been an ever increasing operating expense and loss — can be explained only by the incompetency or dishonesty of the political appointees in charge of these mints. Either alternative is a reflection upon the favorites in charge of their operation. The revenue obtained by the government during the fiscal year of 1874–75 is $682,622.61 more than the government would have received had the mints continued to be leased to private individuals, and when the mint of Mexico City is taken over by the government, the total revenue received from the operation of the mints will by far exceed a million dollars." Where, then, is the "ever increasing operating expense and loss referred to by the 'Boletin Oficial'? According to this information, the Treasury Department received during one single year a net profit of $108,729.57 for the above mentioned mints, and the statement made by the Official Bulletin seems very suspicious. It is unbelievable that with this information on hand, the President of the Republic, Hon. Sebastian Lerdo de Tejada, would have given his official endorsement to a contract by which for the mere trifle of $20,000 the Government leased three profitable mints for a period of three and a half years, and it is far less excusable for the Secretary of the Treasury, Mejia, to submit the contract of August 9th, 1876, for Presidential approval, knowing well that its terms were unjust to the Republic, and on the face of his own statements of eleven months before, it becomes criminal. The lesson so clearly pointed out by the Secretary of the Treasury, Mr. Bonifacio Gutier, rez, and so costly to the country, was never learned by the rulers of Mexico. Among the numerous compilers of Mexican numismatics, four stand foremost: Don Manuel Orozco y Berra; Don José M. Garmendia; Don Javier Stavoli and Don Antonio Peñafiel. The four have been accepted by the Mexican Government as authorities on the subject, and the only records in the national archives about coinage are those compiled by these men. Orozco y Berra has the most complete numismatic history up to 1868; Garmendia from 1874 to 1883; Stavoli from 1883 to 1895; and Peñafiel until 1900. However, the figures quoted by these men show an enormous variance and as an example we shall take the years of 1877–78 and 79 for the mints of Hermosillo, Alamos and Culiacan, and compare just two of them. Figures given by Don José M. Garmendia. showing a difference between the two of $103,510.22 for the three years. This being the case, to which shall the student of Mexican numismatics turn in search of reliable information? As each man worked at different periods it is reasonable to suppose that he was correct on the figures obtained during his term of office. I have used in this monograph the figures of all four, and I have accepted the figures given by Messrs. Garmendia and Stavoli as the most dependable for their particular period because they were at the head of the department of coinage at the time. Let us go a step further and consider the approximate cost of the mint in Hermosillo. The mint building and machinery of Culiacan had cost the government in the neighborhood of $40,000.00 and judging by the total yearly coinage which is so similar in these three houses, the plant at Hermosillo cost the lessees that much. Not having available the amount of coinage for the first nine years we shall take the coinage of 1861–62 as typical of the coinage in the previous years and multiplied by nine we obtain the total approximate coinage for the period 1851–1861 of $1,959,109.83. As I said previously this is only an estimate and for this reason I have exaggerated the expense side of the account considerably, and on the other hand, I have taken the minimum production. It is very probable that the machinery did not cost over $20,000.00 and while it was propelled by steam engines, it was quite rudimentary and not at all expensive. In this connection, it is well to bring before readers the fact just related to me by Don Julio Bouchet, an old resident of Hermosillo, that the first time the machinery was placed in operation, they blew the whistle, and as the people of the town had never heard anything like it, it created considerable commotion. Among the directors of the mint were Don Florencio Monteverde; Don Felizardo Torres; Guillermo Parrodi and Don Gustavo Torres. They were really federal auditors, but I have not been able to find the year or years in which each one served in that capacity. Among the employees were Zenobio Garcia, José Salazar and a man by the name of Padrés. The same types of coinage as given under Alamos were minted in Hermosillo. This applies to the gold, silver and copper coins. Pesos of the balances-type were never minted in Hermosillo. The only difference that existed was in the copper coinage of the years previous to 1863. I have seen specimens of the years of 1859, 1860 and 1863. They are made of copper and the dies most likely were not very deeply cut as the average coin of this type is weakly struck. They measure 32/34 mm. in diameter, 2 mm. in thickness and weigh 12/13½ grammes. Obv. An eagle standing on a cactus and devouring a serpent. Around the upper half of the margin the inscription EST.º LIB.º Y SOB.º DE SONORA. Around the margin, below, a branch of oak on the left and one of olive on the right, united in the center by a bow knot. The mint mark of Hermosillo was H or Hº. The cuartillas emitted from 1859 to 1863 did not bear the mint mark. One centavo pieces were also struck during the years 1880 and 1881 and no record is available. See illustration. This mint as well as that of Alamos was closed by order of the Federal Government during the year of 1895, and the dies and machinery were sent to the Mint at Culiacan, State of Sinaloa. This no longer exists. It used to be on the west front of what is now the federal building. The above statement is the one supplied by the official records but it is by no means accurate. For instance, coinage of two and a half dollar gold pieces is not acknowledged in this list, and Mr. L. W. Hoffecker of El Paso, Texas, sent me a rubbing of one such piece of Ho. mint mark dated 1874. It is also unexplainable how coinage to the amount of $587.13 was obtained. George F. Hill. Attambelos I of Characene. 1922.12 pp. 3 pls. $1.00. M. P. Vlasto. Taras Oikistes (A Contribution to Tarentine Numismatics). 234 pp. $3.50. Edward T. Newell. Mithradates of Parthia and Hyspaosines of Characene. 18 pp. 2 pls. 50c. Sydney P. Noe. The Coinage of Metapontum. 1927. (Part I). 134 pp. 23 pls. $3.00. Edward T. Newell. Two Recent Egyptian Hoards—Delta and Keneh. 34 pp. 3 pls. $1.00. D. H. Cox. The Caparelli Hoard. 1930.14 pp. 2 pls. 50c. Bauman L. Belden. A Mint in New York. 1930. 40 pp. 4 pls. 50c. Edward T. Newell. The Küchük Köhne Hoard. 1931. 33 pp. 4 pls. $ 1.00. Geo. F. Hill. Notes on the Ancient Coinage of Hispania Citerior. 196 pp. 36 dble. pls. $4.00. Jean B. Cammann. The Symbols on Staters of Corinthian Type (A Catalogue). 1932. 130 pp. 14 dble. pls. $3.00. Shirley H. Weber. An Egyptian Hoard of the Second Century A.D. 41 pp. 5 pls. 1932. $1.50. Wm. Campbell. Greek and Roman Plated Coins. 1933. 226 pp. 190 pls. $3.50. D. H. Cox. The Tripolis Hoard. 1933. 61 pp. 8 pls. $1.50. E. T. Newell. Two Hoards from Minturno. 38 pp. 5 pls. $1.00. Howland Wood. The Gampola Larin Hoard. 1934. 88 pp. 10 dble. pls. $3.00.